Delivering a 3D holographic visual experience, Hologruf can bring advertisements, signs, or displays to life through its 3D hologram system. Powered by patented proprietary design, Hologruf–a first-time exhibitor at ISE this year—serves as a portable holographic display, delivering big, colorful 3D holograms floating in midair. 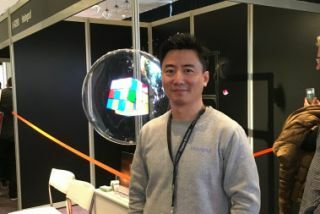 Ted Meng, co-founder and CEO of Hologruf told the ISE Daily: “We use motorised fan technology with a strip of LED running through it, which builds the image when motored. Of course, once it is working, the fan becomes effectively transparent, and only the floating image can be seen. We’re the only company in the market with fans of up to 3 meters and our competitors all use a far bigger motor than us. Hologruf’s motor is up to 50 percent smaller and thinner, making our fans lighter and more flexible and easy to mount in larger configurations.